We recently tried a rainbow fish activity to help my children learn the concept of giving and passing kindness forward. The activity was based on The Rainbow Fish by Marcus Pfister. Rainbow Fish is very proud to have beautiful shiny scales but soon learns he will only find true happiness by sharing a scale with each of his friends. I created a coloring craft page you can print out and have your child design. Depending on their age you may want to work on colors or numbers. Then attach four coins to the fish and tell the child they may keep one coin but give the other three coins to a sibling, friend or parent. You could also use holographic stickers, just cut a section and glue it to the fish so the child can peel them off to share. My kids have been passing out stickers to their dad, cousins, neighbors and grandma. This activity can help them see that sharing will make others happy and encourage them to do it in the future. Children are never too young to learn about sharing our talents and blessings with others. Download the Rainbow Fish PDF by ObSEUSSed. 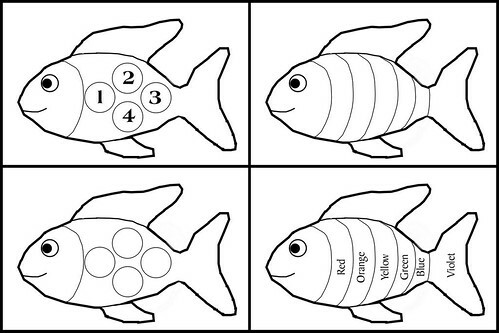 You can print blank fish or fish with labels. Cut out, then decorate. Tape coins or stickers to the fish and instruct them to share. Decorate plastic zip bags like the ocean and put your Rainbow Fish inside. One way kids can give back is to pick out the books they have outgrown and donate them to a local charity. One national charity is Reading Tree. They have drop off bins and will organize and deliver the books to children and schools in need. According to Reading Tree, 61% of low-income families do not have children's books in their homes. This program helps get books into their hands. If your books are falling apart, they'll recycle them for you so it helps the environment too. Don't let those books collect dust. Share them with others today. What is your favorite craft project to work on with your kids?